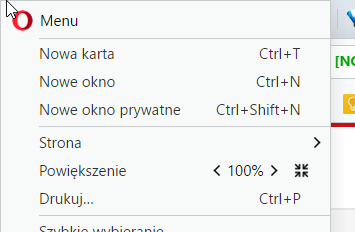 Since the update, I can't close the Opera menu by clicking the same spot I clicked to open the menu. You can open the Opera menu by clicking anywhere on the edge of the screen in the "Menu" area, but you must move your mouse away from edge of the screen more to the center of the button to close this menu. Here's the spot I'm talking about – pressing both on the corner, the top, or the left edge of the screen can't close this menu. There was some minor update, but this thing is still not fixed. Updates should make navigation easier, not harder. It's totally unintuitive that you can click however long you want on the edge/corner, but you can't close this menu. Even a few pixels more to the center of this button, you still can't close the menu. Why act against those who like navigate with edges and corners? The same applies to the dropdown Opera menu. Visually it reaches the left edge, but you can't click anything by clicking with mouse on the left edge of the screen. Didn't noticed that before, but right now happens in every Opera stream, Stable - Beta - Developer.